Joan Barreda pulled off another stunning ride as the 2017 Rally Dakar crosses into Bolivia. The Monster Energy Honda Team rider battled hard throughout the whole stage – not an easy task considering that he was opening the track. The 416 kilometre special subjected the competitors to the first dunes seen so far in the rally, requiring some serious focus and deft navigation skills. Many riders went astray and dropped time. Barreda took the opportunity to tighten the screw, going full throttle on the Honda CRF450 RALLY to put yet more ground between himself and adversaries. From CP2 onwards, the Spaniard led until race-end in Bolivia where the terrain was more precipitous with rocks galore and river-crossings to boot. Joan chose to play it safe in the latter part of the stage, which saw him concede time, and eventually the stage victory. Nevertheless, runner-up spot on the day proved to be equally positive as Barreda widens the gap at the top of the leaderboard boasting 18’19” over Chilean rider Pablo Quintanilla. Monster Energy Honda Team rounded out a red-letter day with Michael Metge posting a virtual podium place. The Frenchman was outstanding in the fourth stage, setting a cracking pace and executing near-perfect navigation. This allowed ‘Mika’ to whittle down some of the time lost in the previous stage and improve in the general rankings. 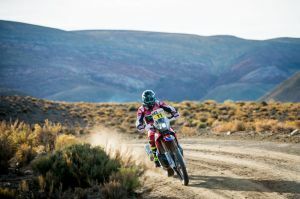 He had been one of the riders to lose out yesterday as race organisers failed to consider the time that some riders had needed to complete the liaison section after getting trapped in a storm on the ascent towards Jujuy. The high elevation will once again take centre-stage for tomorrow’s fifth day that kicks off from Tupiza and concludes in Oruro, once again with heavy measures of dunes and navigation. The Dakar will take up residence on the Bolivian Altiplano. While the organisms will become acclimated, fatigue will set in. In this context, the large variety of terrain makes this stage one of the most demanding. In the purest Dakar spirit the density of the day will be characterised by the two dune sectors that will complicate the final kilometres of the special stage.